The island nation of Sri Lanka is filled with incredibly interesting history and soul-stirring natural beauty. Availing a travel package to Sri Lanka will allow you to explore this home to some of the silkiest beaches and neatly drawn tea plantations; this place exudes extreme influences and blends of Dutch, Portuguese and English architecture. The thriving biodiversity and its colorfully rich culture here remains unmatched to anywhere else in India making it an ideal destination for rejuvenating getaways with family, friends and loved ones. Situated at an elevation of 1,041 meters above sea level and encapsulated in a stunning cotton-like cloud and lush greenery, Ella is famous for its collection of flora and fauna. The cool climate of this pristine region attracts a number of tourists from the low lands of Sri Lanka looking to beat the scorching summer heat. This hideout is a treasure trove for people looking to soak some sun, feel the cool breeze and get away from the bustle of the city life to get in touch with nature. Attractions –Ella rock, Little Adam’s peak, Ravana Ella falls, Dhowa temple. Known for its cool climate and scenic natural beauty, Nuwara Eliya literally translates into ‘city on the plain’. The tea plantations of Nuwara Eliya are a major crowd puller along with the stunning sites of the overlooking mountain of Pidurutalagala. This city was founded by Samuel Baker and is now popular for its massive tea production the landscape of Nuwara Eliya is covered in neatly drawn tea plantations. This place is also dotted with big and small waterfalls and home to a number of architectural marvels that retain the classic features of the colonial period. Attractions –victoria park, lake Gregory, Galway’s land bird sanctuary, Horton plains national park. A UNESCO world heritage site the ruins of the ancient city of Polonnaruwa hold some intensely glorious remains and ruins of the 2ndoldest of Sri Lanka’s kingdom. Preserved in its pristine conditions, every archeological structure here is treasured with great care and concern. Walking here would make you feel like you have walked into the ancient ages of Sri Lanka. The place is also popular for its ancient temple structures which clearly and successfully depict the history and culture of Sri Lanka. The greenery here attracts a throng of migratory birds making it an oasis for bird watchers. Attractions –Minneriya national park, Gal vihara rock temple, parakrama samudra. Standing tall at an elevation of 2,243 meters above sea level this unique conical shaped mountain is known for a religious reason. Apart from the undeniably stunning natural beauty this place is also known for its ‘sacred footprint’ or sripada which is known for holding the footprints of Gautam Buddha according to Buddhist tradition and according to the Hindu tradition it holds the footprints of Lord Shiva and as per the Christian or Islamic tradition it holds the footprints of Adam or St. Thomas making this place one of the prime destinations for a religious awakening. Attractions –Kithulgala river rafting, laxapana falls, Aberdeen waterfalls, spice garden. Located in close proximity to the town of Dambulla this ancient rock fortress holds an immense archeological and historical fascination. 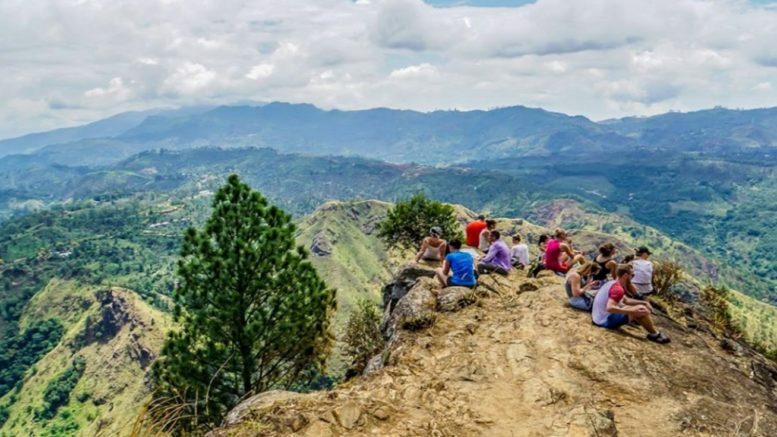 Dominated by massive rock columns of 200 meters this plateau was once the capital for King Kasyapa and still serves as one of the most awe-inspiring structures in Sri Lanka. A UNESCO world heritage site the name of this place literally translating into ‘the lion rock’ this place represents one of the most finely preserved examples of ancient urban planning. Sigiriya is replete with neatly lined gardens and pools. Attractions –sigiriya museum, oakray woodcarvings, Sigiriya citadel. Nestled on the southern end of the Sri Lankan island landmass and with no dearth of swaying palm trees, Mirissa is known for its relaxing atmosphere. Popular mostly among the young crowd and people looking to experience a thumping time this beach town is known for its incredible nightlife and also for its golden sandy beaches. The beaches here offer you the opportunity to indulge in some unique whale and dolphin watching experiences along with being a famous fishing spot. Do not forget to indulge in some deliciously prepared local cuisines which will be definitely an experience of a lifetime. Attractions –Mirissa beach, whale watching, Sri Sunandarama temple. Famous for being the 2nd largest national park in Sri Lanka this magnificent national park is bordered on one side by the grand Indian Ocean. Created by unifying 5 blocks, two of these blocks are made open for public safaris during which you can witness a range of biodiversity that this place boasts of like, Srilanka elephants, Sri Lankan leopards as well as some aquatic birds. Attractions – buduruwagala, okandadevalaya, kebiliththa, tsunami memorial, magulmahaviharaya. This bustling capital of Sri Lanka is also the largest city in Sri Lanka and is located on the western coast of this magnificently stunning island. This place represents the incredibly interesting combination of the bygone ancient era with the current and present digital age. Here you will be experiencing the natural beauty of Sri Lanka when it comes in contact with the thumping nightlife and the electrifying vibe of this magical city. Being a combination of lake and land, Colombo has a number of interesting and unique features that set it apart from the rest of the island. Attractions –Pettah, Gangaramaya temple. Galle faces the beach, national museum of Colombo. Home to some of the most opulent and beautiful looking temples in Sri Lanka, this ‘city of temples’, attracts a massive thring of visitors looking to have a religiously spiritual experience in Sri Lanka. The temples here can be dated to as far back as the ancient ages and is known for holding immense significance to the ethnic groups of Sri Lankan Tamils, Sri Lankan Moors and Indian Tamils among others. This is the perfect place that will introduce you to the rich historical background of Sri Lanka along with familiarizing you with its incredibly vibrant culture. Attractions – Jaffna dutch fort, Nallur Kandaswamy temple, fort Jaffna, archeological museum. Popularly known as the Golden Temple of Dambulla this UNESCO world heritage site ranks among one of the largest and the most well-preserved cave temple complex in the island of Sri Lanka. There are around 80 different, unique listed caves in this surrounding region with some of the major attractions here containing statues and paintings related the life and times of Gautam Buddha with almost 153 different statues dedicated to him. According to the prehistoric Sri Lankans, this site was also once a burial site for the local population here making it even more interesting. Attractions –Minneriya national park, Popham’s Arboretum, Dambulla economic center, Ibbankatuwa megalithic tombs. This Buddhist temple is located in the scenic city of Kandy and is present inside the royal complex palace and is known for housing the relic of the tooth of Gautam Buddha. Ever since the ancient ages, this place has served a vital role in the lives of devout Buddhists. Inside the temple, every inch is decorated and adorned with intricately created designs, carvings, and elegant engravings. The entire perimeter of this temple is surrounded by lush and thick greenery that makes it one of the most serene destinations in Sri Lanka. This quirky coastal town is located in the district of Galle in Sri Lanka and attracts a number of tourists from far and wide looking to spend their time amongst some peace and quiet. The roots of this pristine beach can be traced back to the holy Hindu epic of Mahabharata where Valmiki had described this beach paradise. Rich in biodiversity and known for its eco-tourism options this beach is the ideal beach destination if you are looking to soak in the sun during your visit to Sri Lanka. Attractions –Japanese peace pagoda, galle town and fort, jungle beach, sea turtle farm. Also known as Trinco, in short, this northeastern town of Sri Lanka is the best place where you can experience some thrilling, fascinating and adrenaline pumping water sports activities in its clear blue / green waters. Replete with magnificent landmarks and a fascinating historical accounts place is offers some of the freshest and rejuvenating experiences. This place also showcases some traces of the British presence through its architectural structures. If you want to have a combination of peace and thrill then this is the place to be. Attractions – koneswaram temple, fort Frederick, Shankari Devi shakti peetham, lover’s leap scuba diving. The city of Kandy lies amidst the hills of the plateau region and is studded with lush tea plantations among other religious sites. The place showcases an undulating lush green landscape which is dotted with colorful houses. Kandy is known for its incredible beauty and fresh ambiance. If you want to have a closer look at the beauty that is held here then taking a train ride from Nuwara Eliya to Kandy is the best way of discovering the beauty that this place really is. Attractions –Udawattekele sanctuary, Commonwealth war cemetery, millennium elephant foundation. Known for being one of the most prestigious ancient capitals of Sri Lanka this world heritage site is known for being the hub for Theravada Buddhism and its history can be dated back to the 4th century BCE. Surrounded by numerous Buddhist monasteries and ancient sites this place exudes an immense sense of peace and serenity. Covered in lush greenery and replete with a sense of immense spiritualism, this place is one of the most peaceful destinations in Sri Lanka. Attractions – mihintale, ruwanwelisaya, ritigala forest, jethawanaramaya stupa. Be the first to comment on "15 Beautiful Places To Visit In Sri Lanka"